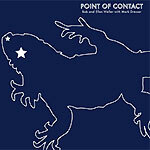 CD reviews: "Point of Contact" and "Friendship and Remembrance"
These reviews first appeared in the March 13, 2008 issue of the North County Times. Inhabitating a creative space somewhere between John Cage and the Art Ensemble of Chicago, "Point of Contact" from a local flute-piano-bass trio is one of the more explorative releases to come out of San Diego in some time. Ellen Weller describes the playing as ensemble improvisation  each of the three creating new music on the fly, while simultaenously listening to and interacting with the others. Heady stuff, to be sure. But the end result here isn't especially listenable (not that Art Ensemble of Chicago or Cage ever were all that fun a listen, either). While it's an impressive effort, the listener's admiration comes more respect for the difficulty of what they're pulling off than any innate attractiveness of the music. For those unfamiliar with experimental music, much of what's on this CD may sound like noise: Bob Weller plunking along on piano atop wife Ellen's trills or growls on flute or clarinet, dresser setting a variety of rhythms on acoustic bass. It's done well, but doesn't push beyond where they and others have already gone in the 1960s, '70s and '80s in terms of trying to redefine what music is. 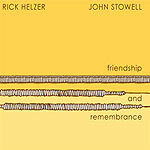 Not as out-there as the Weller/Dresser release, "Friendship and Remembrance" from pianist Rick Helzer and guitarist John Stowell would be a comfortable fit on Euro-jazz label ECM. Hewing in spirit to the jazz-new age fusion of Oregon, "Friendship and Remembrance" might best be called "mainstream experimental." Each of the songs is still anchored by a melody, several of them quite lovely, and while both Stowell and Helzer can both stretch those melodic themes pretty far in their solos, that sense of melodic cohesion holds everything together. Particularly moving are moments such as those on track 4, "Passage," in which Stowell and Helzer improvise the theme together, both playing lead at the same time. It's just beautiful.